Target your Facebook ad audience based on your bot's users. The People tab is a potent tool to intelligently create a target audience for your ads based on what Facebook calls a lookalike audience. A lookalike audience is a way to reach new people who are likely to be interested in your chatbot because they are similar to your best existing bot users. Facebook Ads Manager needs a list of Messenger User IDs to be able to create a lookalike audience. To do this, head to your bot's People tab and set a user filter to select the qualifying criteria for your lookalike audience. 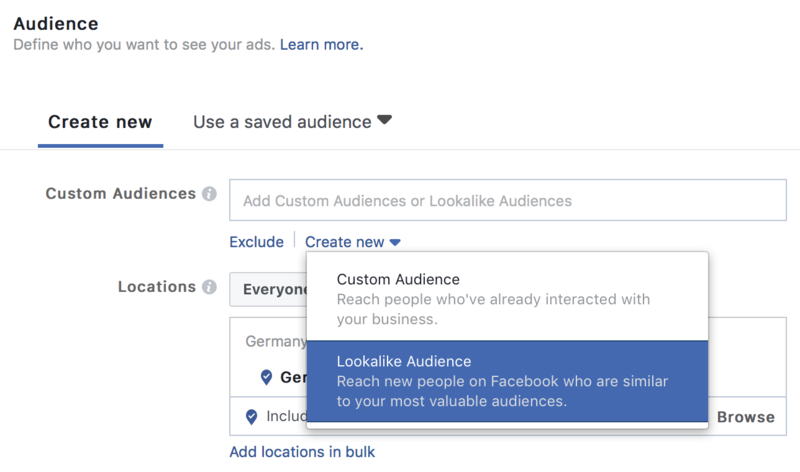 Please note that you need at least 100 users from the same region for Facebook to successfully create a lookalike audience. In our example, we only want people who are more likely to complete a questionnaire and become paying users to see our ads. We now just have to press Export, and People tab will prepare a CSV-file for us to download, which contains all the information about those users — including their Messenger IDs. Now that we have exported the Messenger IDs of the qualifying users we need to open our Facebook Ads Manager and choose the Messages marketing objective to create a new campaign. In the Audience section we then select Create new and Lookalike Audience. On the next screen, select Create new again and then Custom Audience. You will then be prompted to select a way to create a custom audience. In our case, this would be using a Customer file. Press Add customers from your own file or copy and paste data, and now we finally can upload our People Tab CSV file. In our case, we do not want to upload anything but the Messenger User ID, so we make sure that Do not Upload is selected for all other fields, and choose Facebook Page user ID for the Messenger User ID field. Facebook will now also want to know the Page ID of your Facebook page, which is usually the part after facebook.com/ in the URL when you visit your page. Sadly Ads Manager does not support custom URLs like facebook.com/chatfuel, but only numeric IDs. If you have a custom URL you can visit Find my Facebook ID, paste the link to your Facebook Page and the site will then return a numeric ID, which you can enter in Ads Manager. 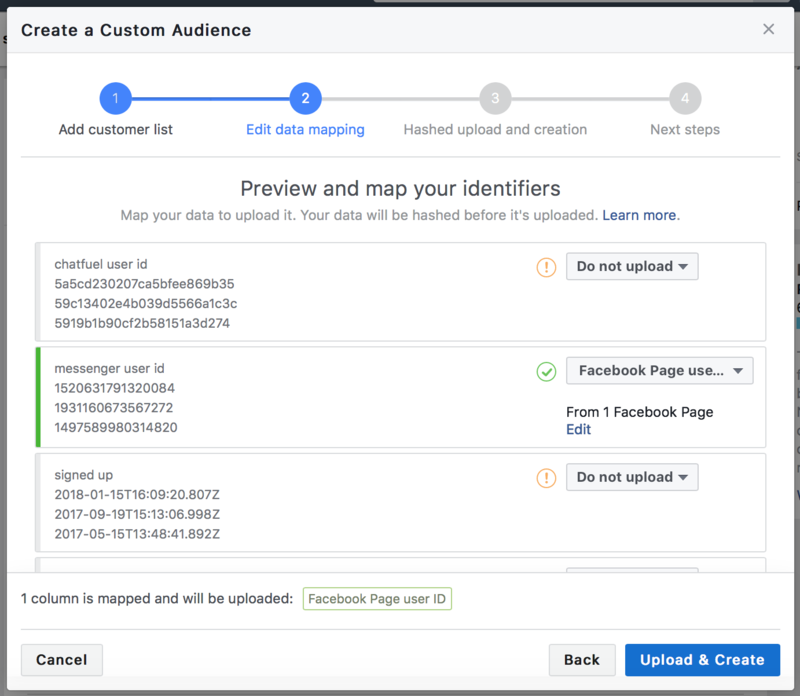 In the next step press Create a Lookalike Audience and you will then be able to select the countries or regions you want Facebook to use to create your lookalike audience and also how broadly you want Facebook to match your qualifying users to the selected population. Now just select Create Audience and voilà! Facebook will now use your qualifying bot users, selected in advance, to create a similar behaving audience for your ad.